This is the most important part (at least for me). The foundation. 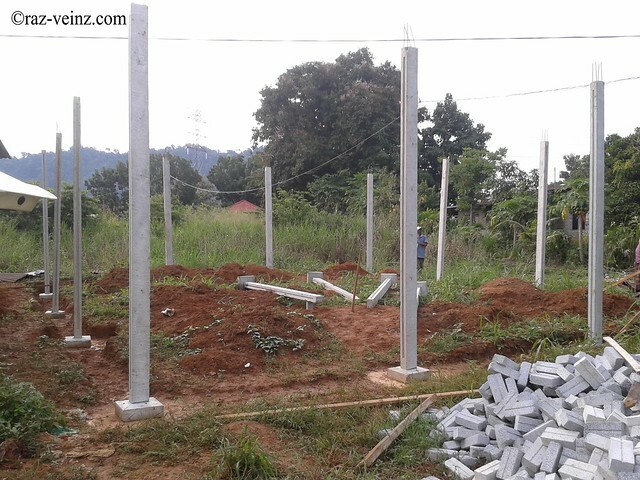 “A foundation (or, more commonly, foundations) is the element of an architectural structure which connects it to the ground, and transfers loads from the structure to the ground. 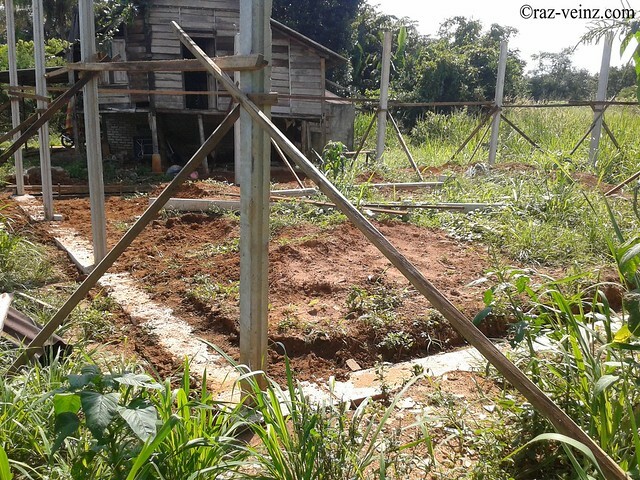 Foundations are generally considered either shallow or deep. 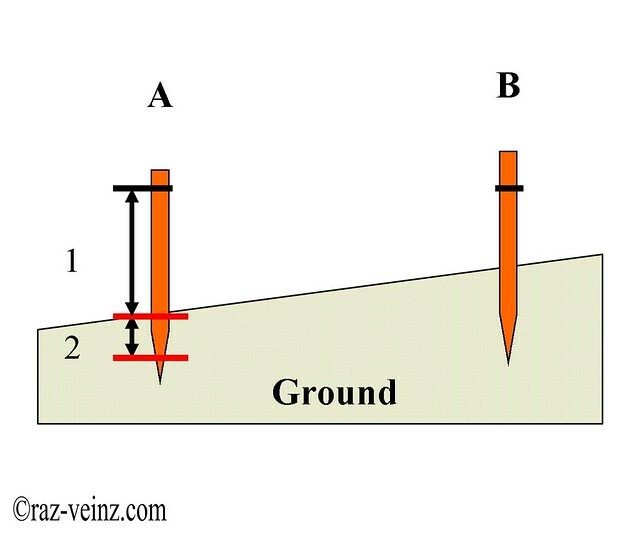 Foundation engineering is the application of soil mechanics and rock mechanics (Geotechnical engineering) in the design of foundation elements of structures.” Source : https://en.wikipedia.org/wiki/Foundation_(engineering). 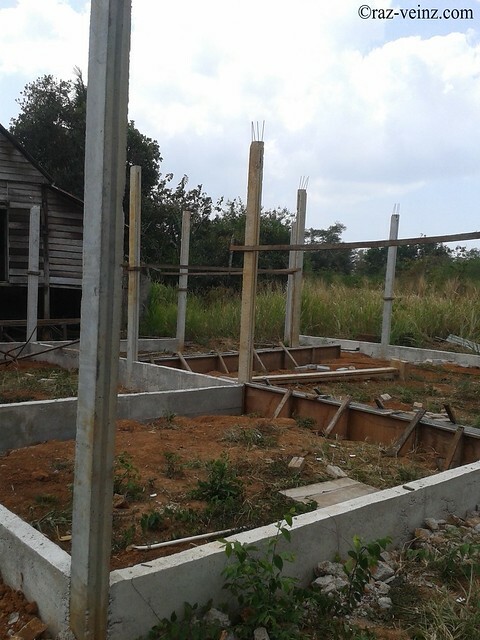 There are many method/type for foundation, it depend on various of aspect, soil type, equipment, cost etc;, I’m not claim my foundation is perfect, it’s just work for me. If your study further more, even the soil investigation will make your head spinning, all about time and money, in my case, I’m not do the mega-structure, so, experience playing the rule here and all within the spec. 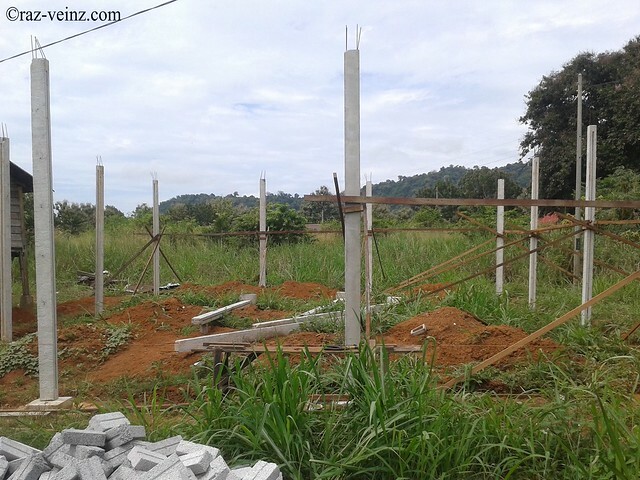 This is the important part, mostly because the uneven soil surface or has hills. 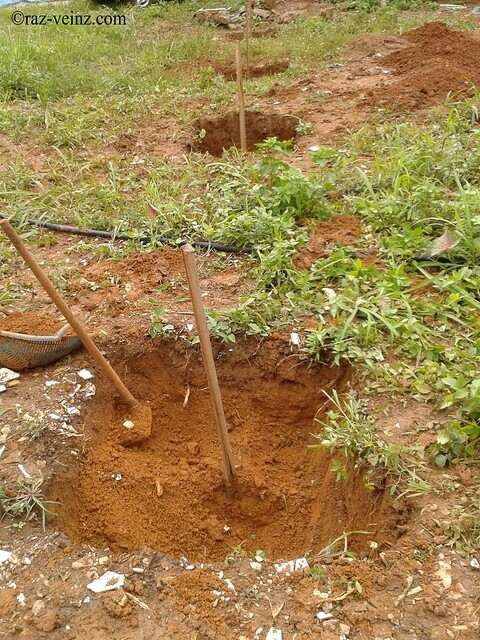 This process will tell how different the ground level from stake to stake and how deep we need to dig every pad footing locations. 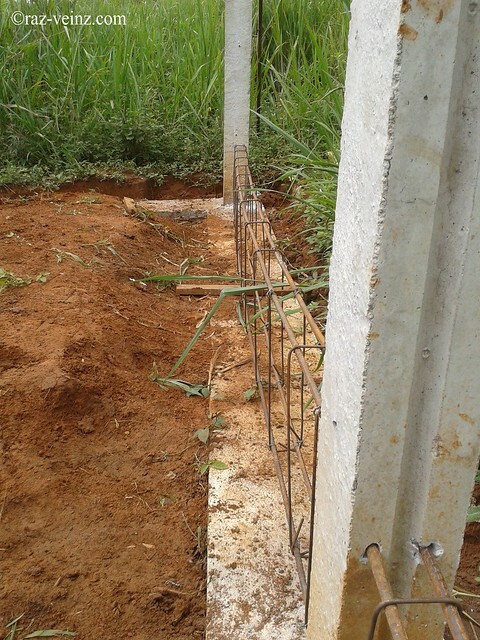 From the previous post, I marked the pad footing with the wooden stakes. 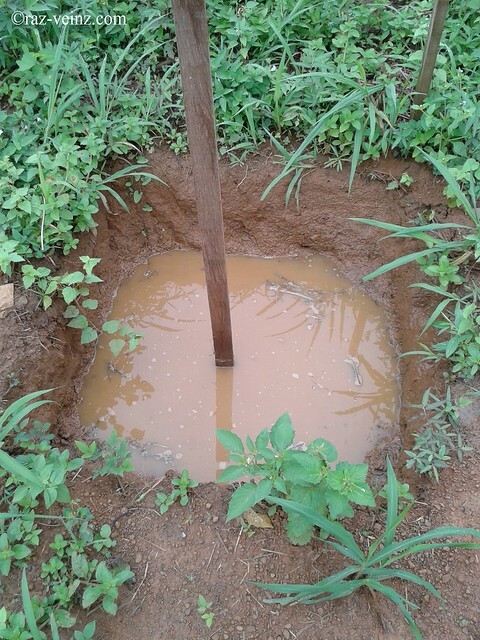 Randomly mark the highest ground level wooden stake, for example in picture below, I mark stake B (I named the mark with the ‘black line’), so, stake B will be reference for all other stakes. I used the traditional way, Bernoulli’s principle, fluid dynamics. 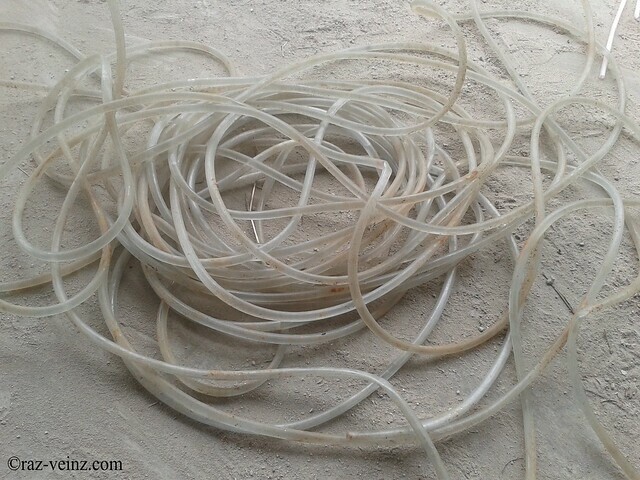 Using water (or any fluid that minimize/terminate the air bubbles), clear PVC tube flexible hose pipe (length = The longest distance of the building+a few meters spare) and need at least two peoples to do this job done. Filled the tube with the fluid, reserve about 1 feet, make sure there is no air bubbles. Person B will hold the end of the fluid at stake B, While the Person A will hold the end of the fluid at stake A. Person B will make sure the end of the fluid precisely parallel with the ‘black line’ at the B stake (I know that is not a wooden stick, just for demo only). After that, person B will telling at the person A. Then person A will mark the stake A exactly at the end of the fluid. repeat this process for all the stakes, make stake B as reference. 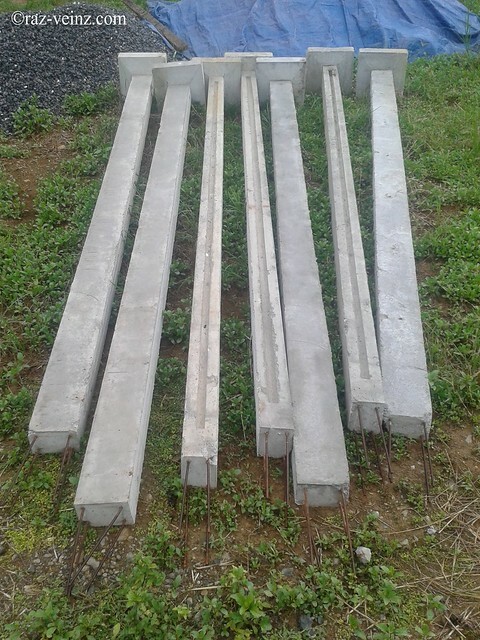 At this point, this is your decision, how much your desired height from ground to your building floor? From the lowest or the highest ground level? 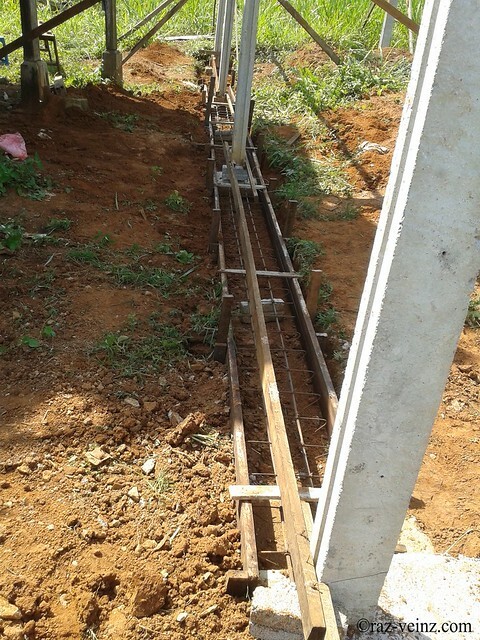 In my case, I measure from the lowest ground level, from the lowest level ground I want to build 1.5 feet ground beam (between length 1), from the ground to underground I need to dig about 3’x3’x0.5′ for pad footing (length 2). 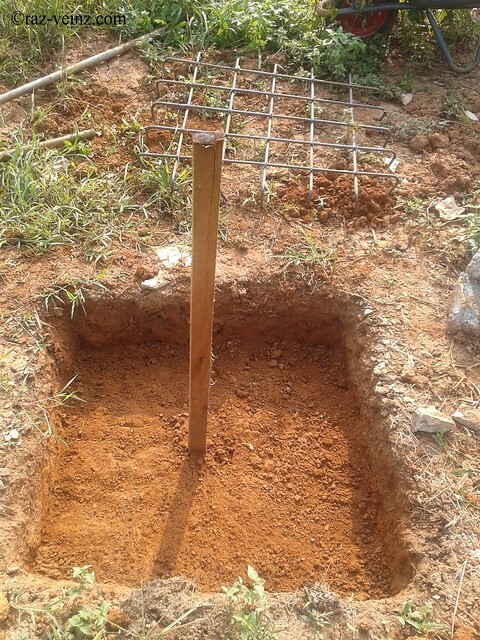 So, how deep you need to dig every pads footing? Length 1 + length 2. Yes, I dig it by hand. This is the trials after raining days. 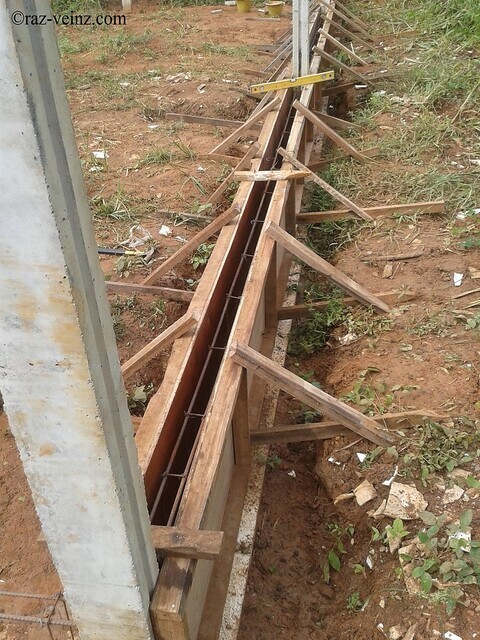 The advantage of excavation by hand is you didn’t need to make the pad footing formwork, since the ground itself will be the permanent formwork. 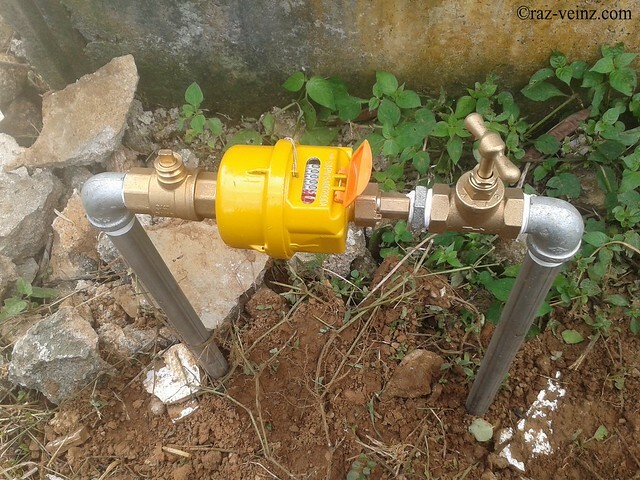 This procedure below for ready-made-pillar only. No need for stump procedure. 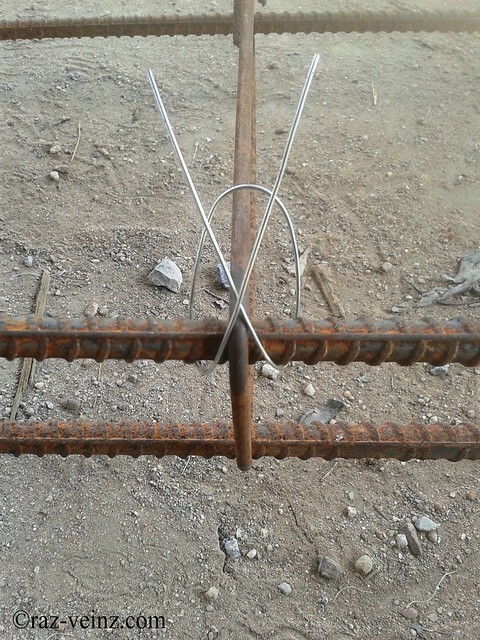 Prepare the rebar (short for reinforcing bar), 3’x3′. 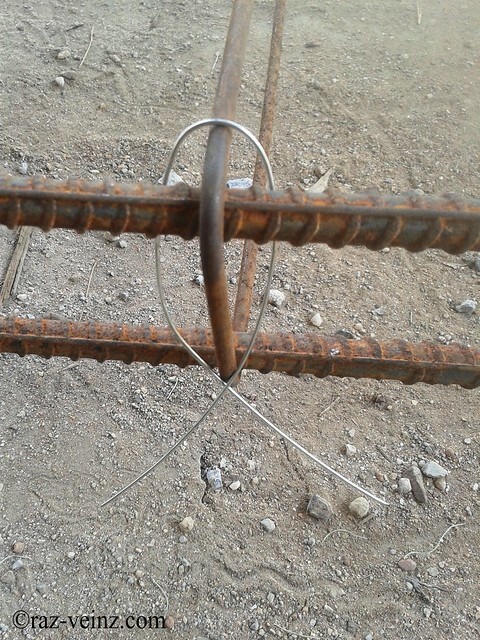 Using Y10 BS 1.02 reinforced steel. Prepare the concrete. 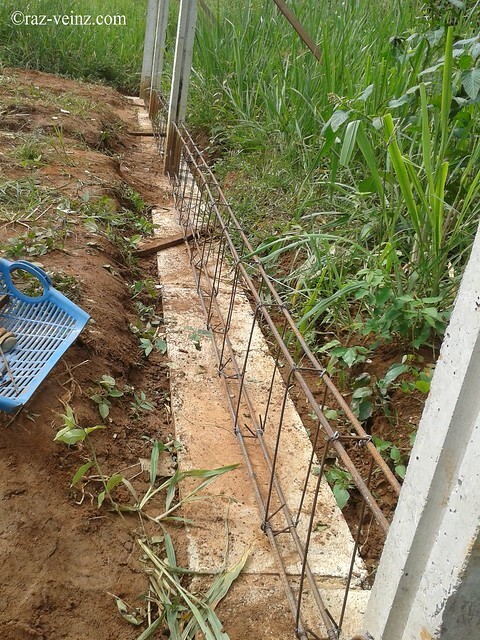 Ratio for the foundations and footings that I used is, 1 part of cement with 3 parts of sand and 6 parts of aggregate (1:3:6). 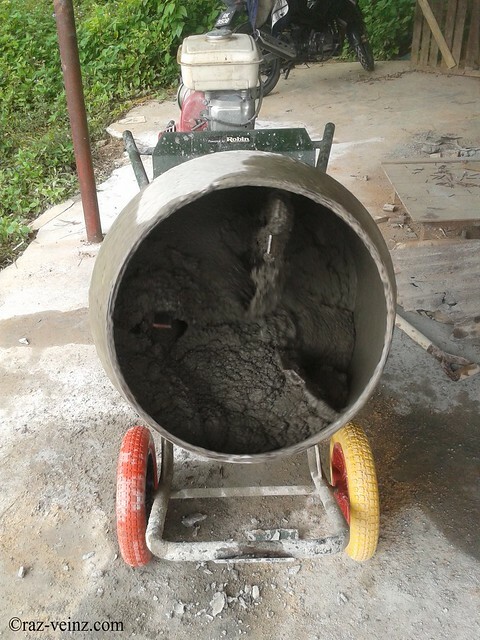 This concrete mixer is more than help, worth to buy. 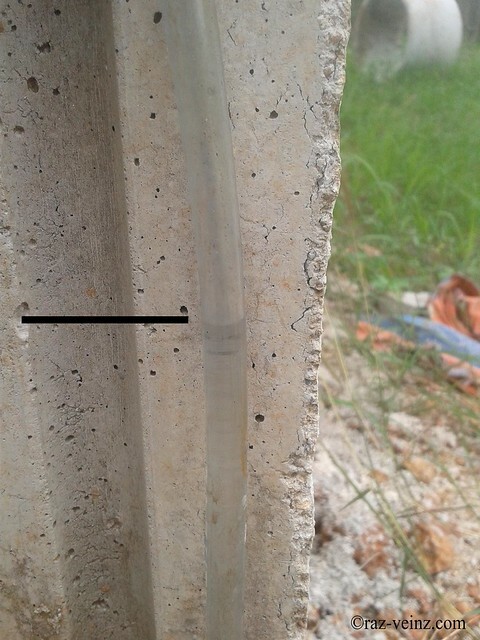 A slump test is a method used to determine the consistency of concrete. 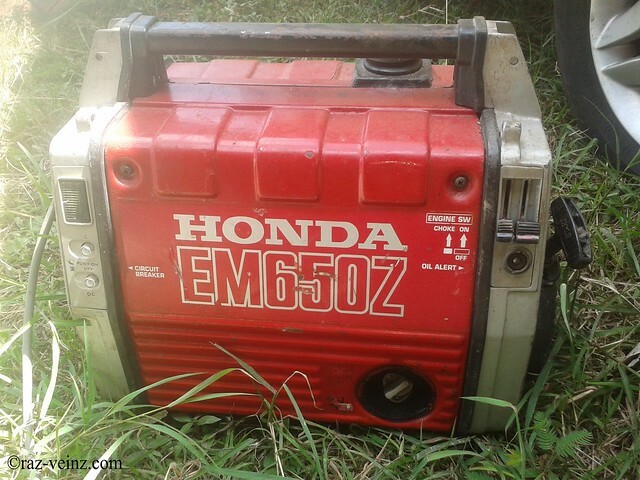 Once again, powered by Honda! 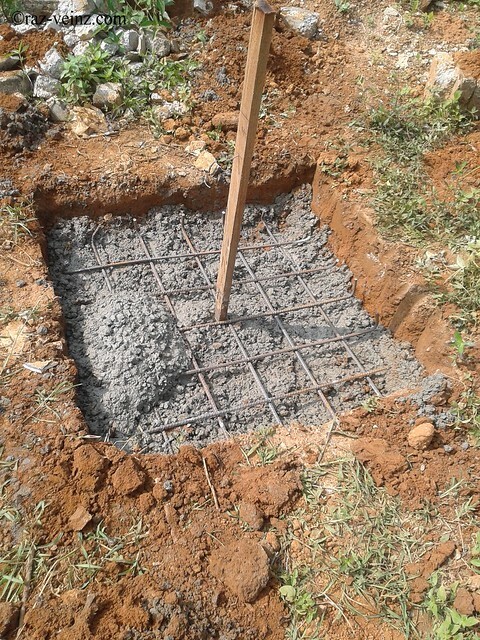 Pour concrete half of the pad footing then put the rebar then fully cover it with the concrete, so, no need for spacer, rebar will be permanently embedded in center of poured concrete to create a reinforced concrete pad footing structure to support the ready-made-pillar. 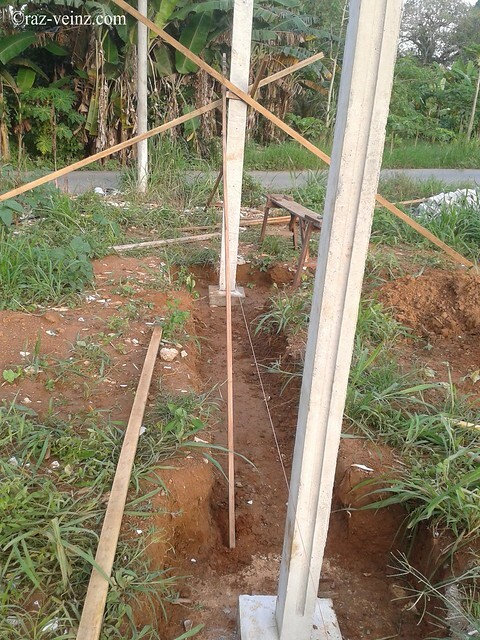 Ground level beam foundation is common type of foundation to support the building and the loads that are within or on the building, and this is the type of foundation that I will apply, T-shaped foundation. 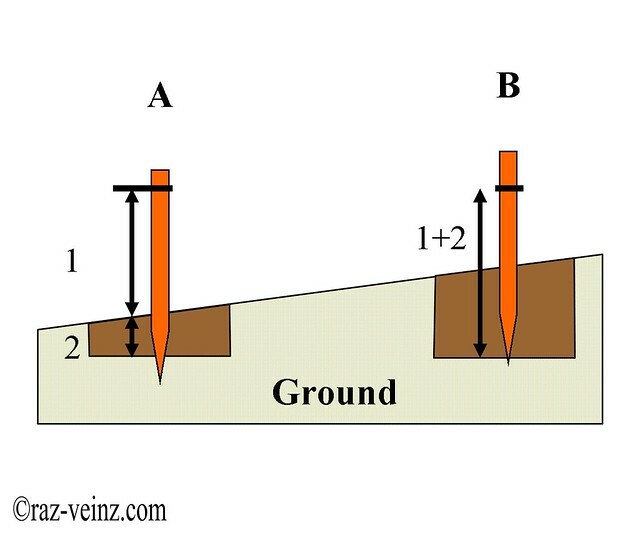 The depth of a strip foundation must be equal to or greater than the overall width of the wall. 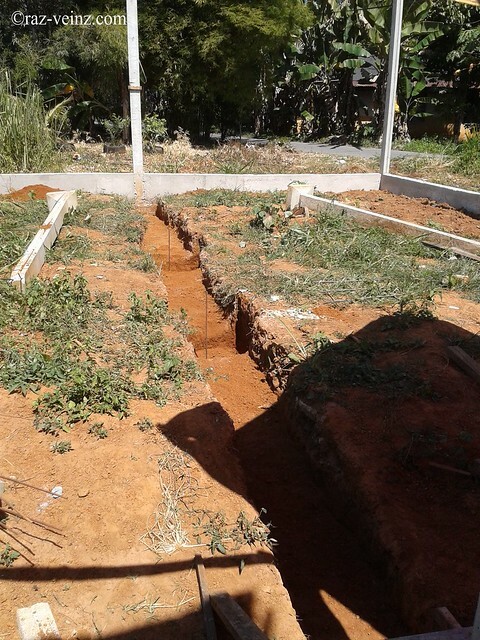 The width of the foundation must be three times (or greater, depend on others factor, such type of soil, lab analysis, etc. ) 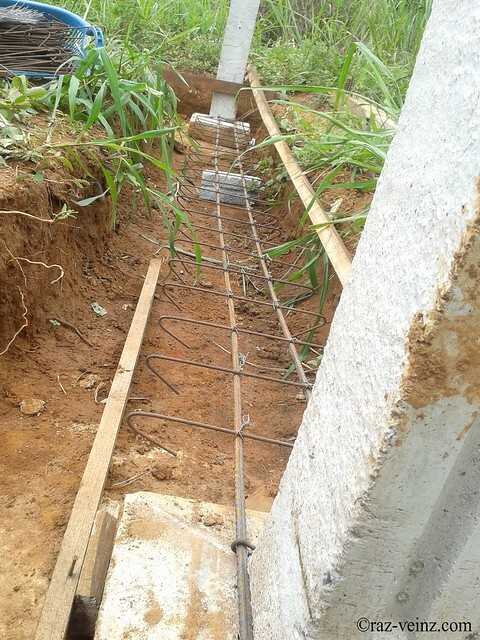 the width of the supported wall to allow for enough concrete to get a good bearing. 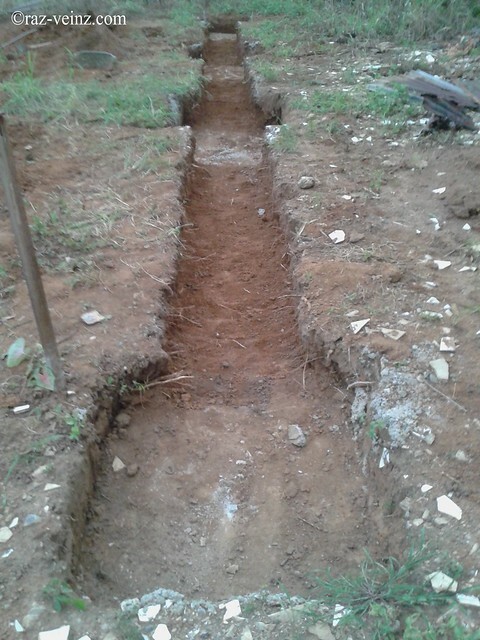 I Dig a trench between pad footing (about 2 ft. width ((4 inch brick width x3)+ 1′ reserve for formwork)), level the depth parallel with the each pad footings. 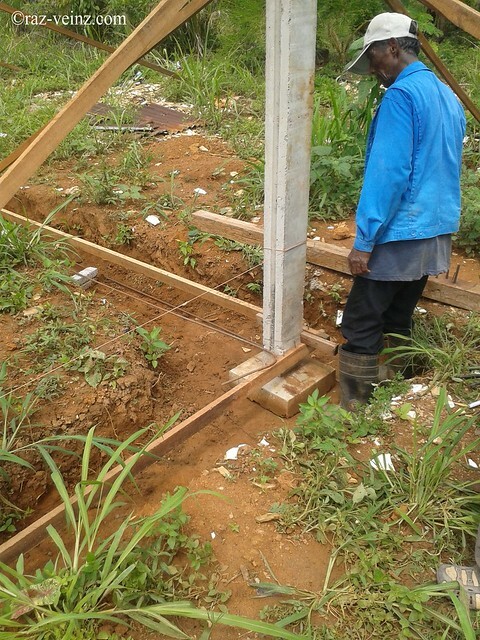 Stand the pillars at the pad footing locations. 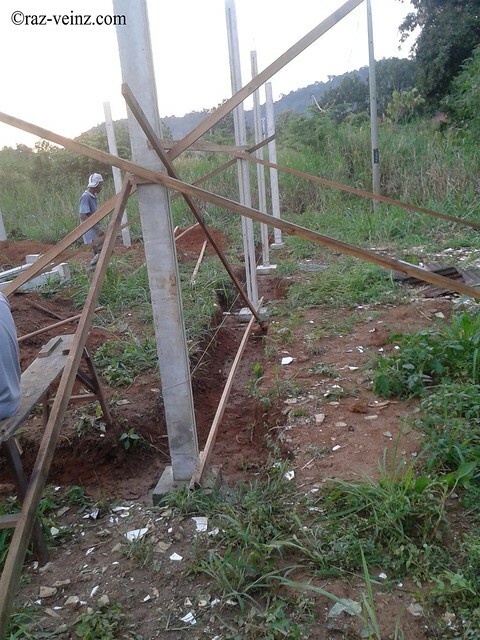 Repeat the last post procedure, just change from the stakes to the pillars. Measure the length between pillars, level it with the spirit level then use 1″x2″ woods to make sure it steady at the placed. My father check for the accuracy. 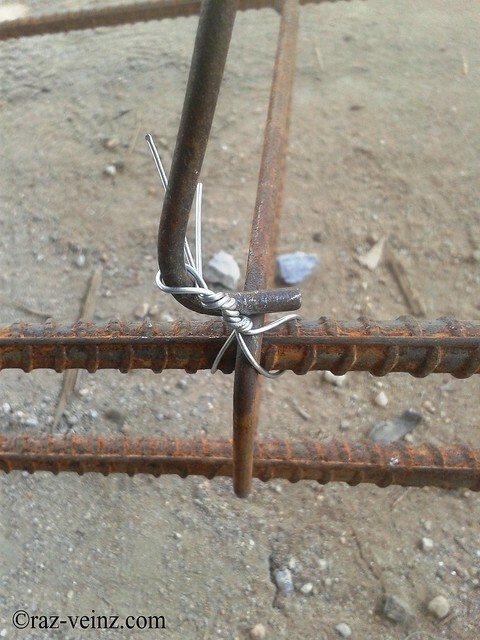 Prepare the rebar using Y10 BS 1.02 reinforced steel. 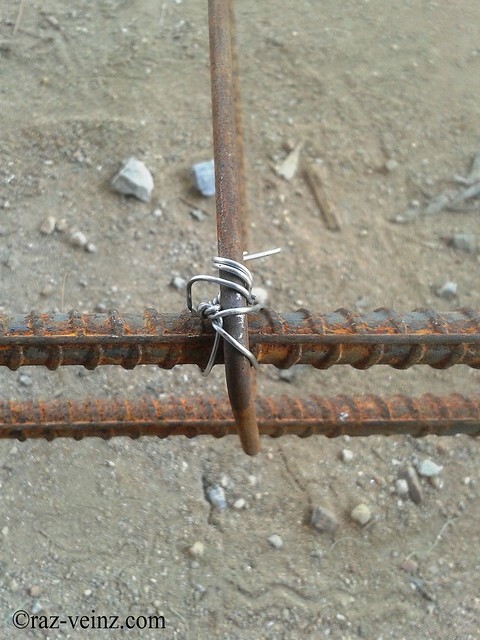 R6 steel as rebar ligatures to provide shear reinforcement in concrete beams. The picture will tell better. 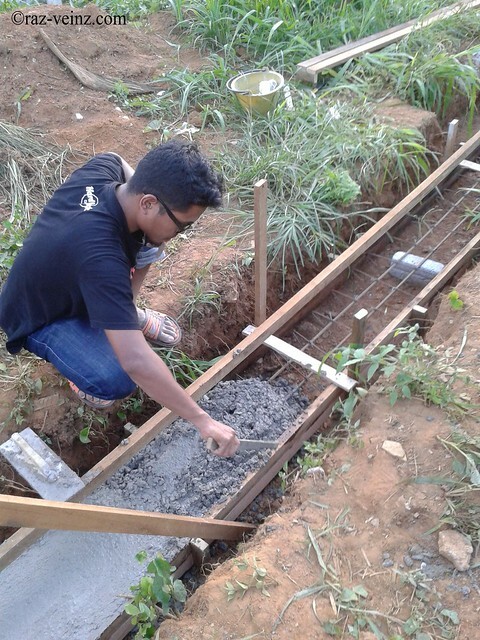 My brother using the traditional way to consolidate the concrete, to reduce the amount of air pockets inside the concrete mass. 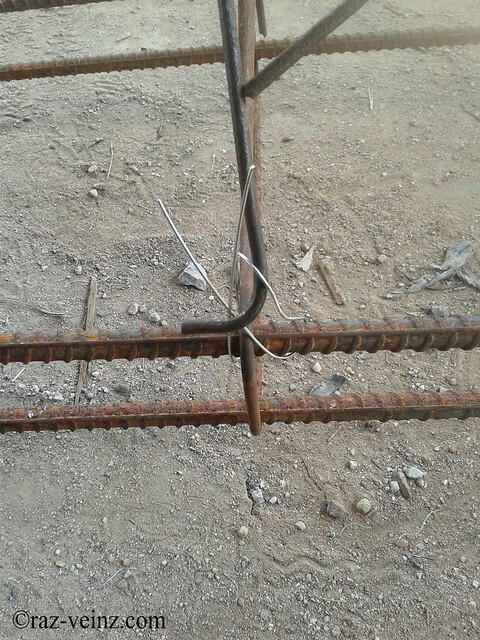 Use the brick to make sure the rebar in the center position, then remove before the concrete reach the brick. 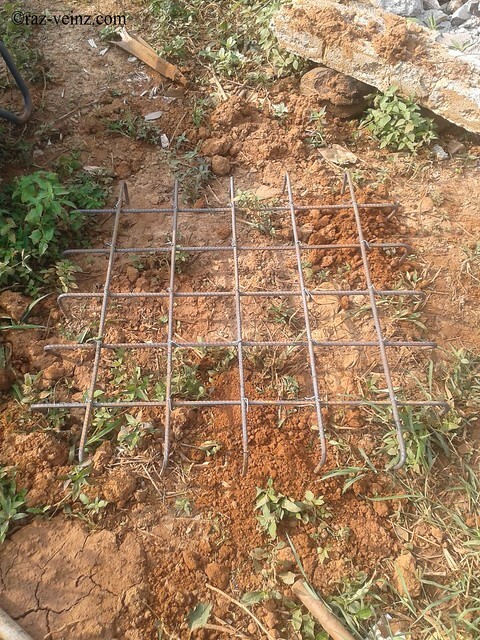 Prepare the rebar cages for the ground beam. 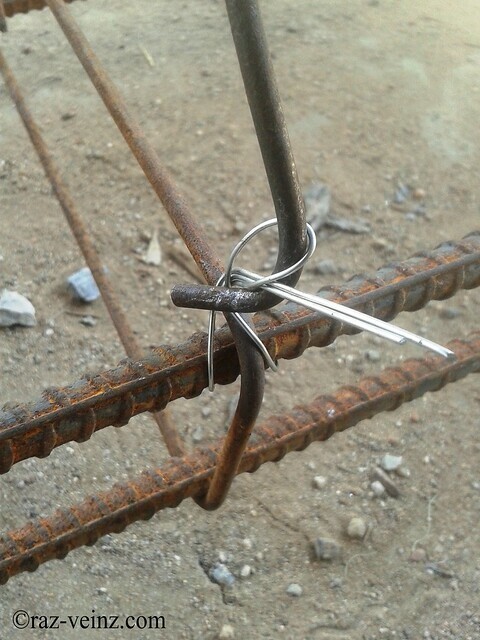 Using Y10 BS 1.02 reinforced steel as well and R6 steel as rings. 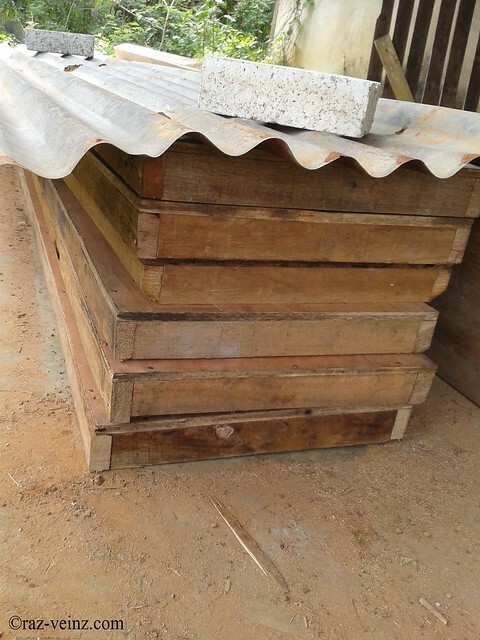 Prepare the ground beam plywood formwork. 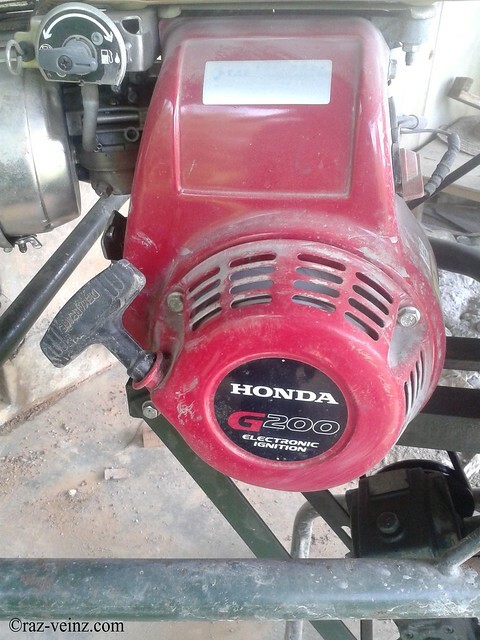 I apply used engine oil at the formwork surface as release agents. 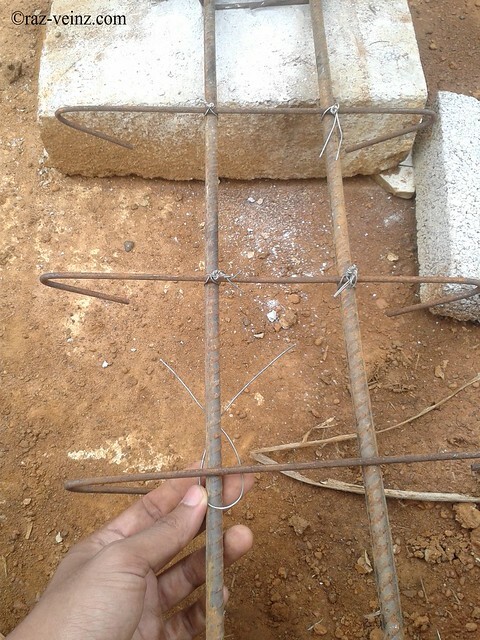 Enclose rebar cages in formwork. 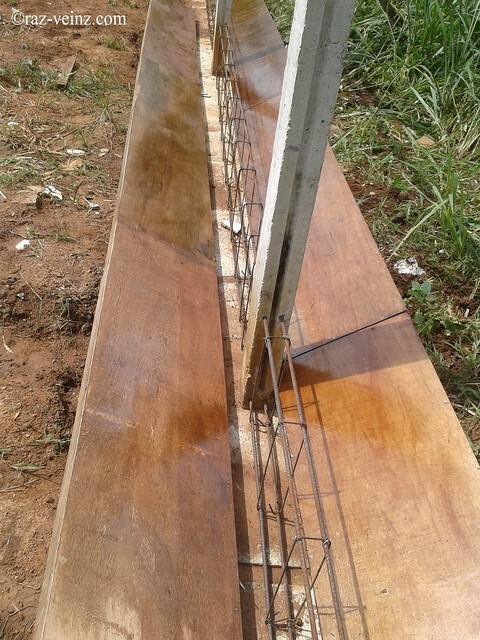 Make sure the formwork is strong enough, as though as you didn’t want to remove it anymore. Level it using spirit level. 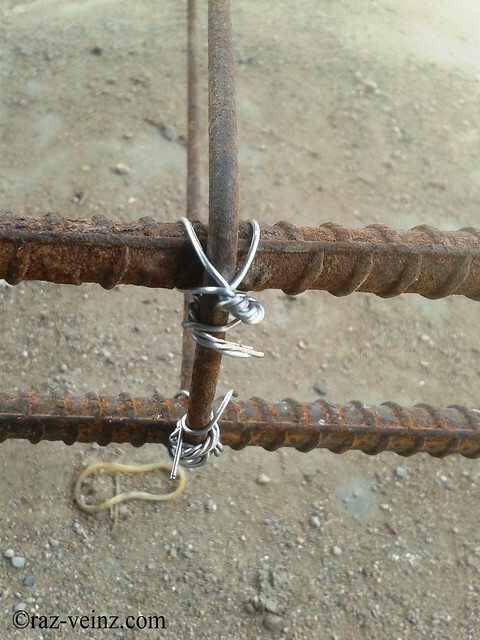 If you notice, in-front of level spirit, there are small wooden stick, I used that to hang the rebar cages, tied with string, remove that after pouring the concrete. 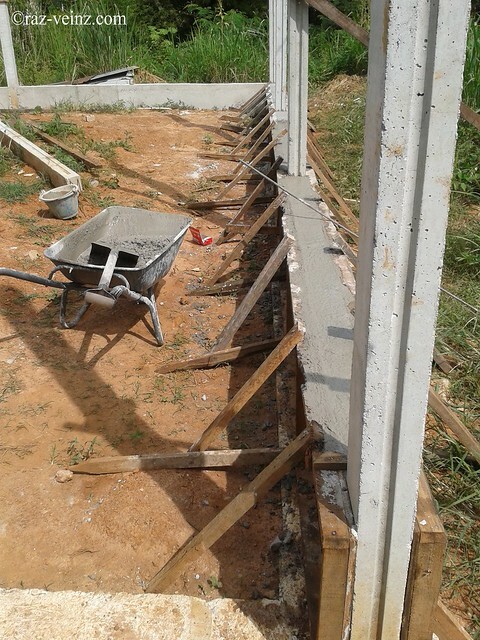 Pouring the concrete and consolidate it. Make sure to leave an in-and-out internal access for the last part. I think this is the hardest job to be done, need a lot of effort, money and time, and I glad it done well!